With a diverse landscapes, stunning mountain ranges, spectacular rivers and waterfalls to lush forest and tablelands, this tiny Himalayan kingdom is truly blessed with numerous terrain for trekking; all showcasing the magnificent vistas and panorama like no other. A cultural discovery adds another dimension to mountain treks in Nepal that are worth a visit. Everest Base Camp, located to east-north part of Nepal, is one of the hunting paradise for thousands of trekking enthusiasts. EBC Trek is one of the most sought trekking destination in world; for its mesmerizing view of snowy giants, geographical varieties, wonderful trekking facilities and warm hospitality of people. The most spectacular highlights of Everest Base Camp is that you get face-face view of Mt. Everest towering at an altitude of 8,848m. Plus you get close glimpse of some of the tallest peaks like Mt. Lhotse, Mt. Cho Oyu, Makalu and other neighboring peaks. Moreover, Trekkers will stay at local tea-house which allows close interaction with local Sherpa people. The hospitality of local is intriguing. Plus, You will discover the local culture and lifestyle of Sherpa people where simplicity and ancient tradition are still the way of life. As Everest Base Camp Trekking takes you to extreme elevation (5,545m), the hiking trips takes around two weeks starting from Lukla. You must be cautious about the misleading trekking routes and potential mountain threat. Moreover, you have to get prepared well to complete the trek safely and successfully. 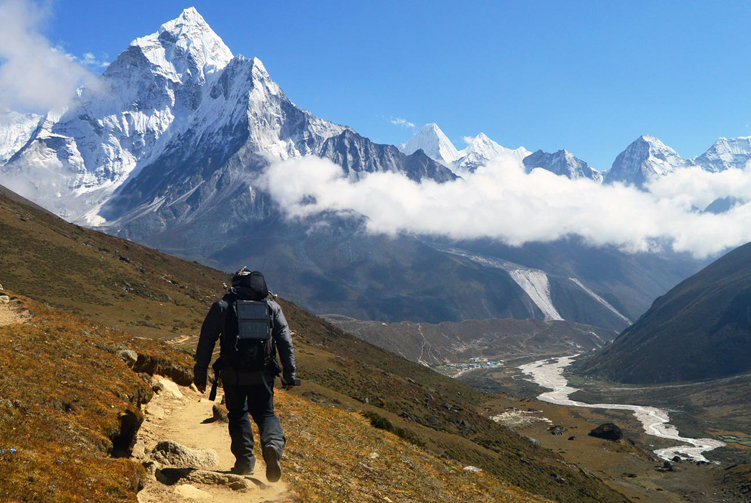 There are many things to consider before starting your hike to Everest Base Camp. This article will provide the ultimate guideline for Everest Base Camp Trekking. How long people have been trekking to Everest Base Camp? 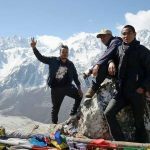 How much does it costs to go Everest Base Camp? How long does it take to complete Everest Base Camp Trek? Can you fly to Everest Base Camp? What is food and accommodation like in Everest Base Camp? Is Everest Base Camp Trek Dangerous? What is the distance of Everest Base Camp Trek Route? Temperatures at the summit of Mt. Everest are always below freezing level. The temperature during January can drop as low as -60 degree Celsius (-76 degree Fahrenheit). While Everest Base Camp nestled at an altitude of 5,364m tends to change its weather according to the season. Mount Everest is located 28 degree north of the equator and has typical northern hemisphere seasonal pattern. It is highly influenced by the Indian Monsoon which brings clouds and moisture from June to September. Autumn (October – November) and spring (March – May) are considered as the best time of the year for EBC trek. 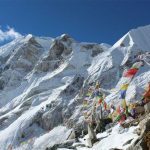 Winter starting from November – February is winter in Everest Base Camp. The EBC region is dominated by the southward migration of the northern hemisphere jet stream which brings high winds, clod temperature and occasional snow falls. Winter is great trekking time if you wish to avoid the crowd and enjoy the magnificent views. It is said that the mountains are at its best outfit in winter. Nights are extremely cold (below freezing) while days are usually sunny with clear blue skies. March until Monsoon is the second best season to hike Everest Base Camp. The weather at higher altitude in moderate and views are excellent. The entire EBC trekking trail is covered with blooming rhododendron and lush vegetation. We can see lots of trekking and climbers walking in t-shirts. The monsoon starting from June to September in EBC trail receives heavy downpour and days are often occupied by clouds. You might find less traffic but the view are often blocked by the grooving black clouds. Plus the trail are usually slippery and continues rainfall invites the threat of flood and landslide at hilly region. Probably the most favorable season to trek Everest Base Camp. 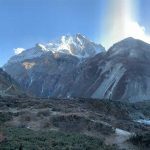 After the conclusion of Monsoon and before the start of winter, EBC receives flocks of travelers as the temperature is perfect and the views are dramatic. Maps are most important things to pack when you are out in new places. There is high chance of getting lost in the trail; as there no proper pathways, signals and good communication mediums. You must hold a proper map either in printed form or an online map. The Everest Base Camp trek starts from Kathmandu but the actual walk begins after your arrival in Lukla. From Kathmandu, you can take a trans-Himalayan flight to Lukla and begin your trek. 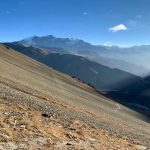 Alternatively, you can use the traditional route; followed by the legendary climber Sir Edmund Hillary and Tenzin Norgay Sherpa. Drive north east from Kathmandu to Jiri and start your trekking trail. 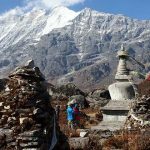 The classic route is for those who wants more trekking experience or for those who fear the Lukla flight. 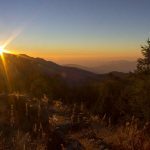 From Jiri, you will rise up to Lukla (which adds 3 – 4 more days) and follow the regular EBC trail. 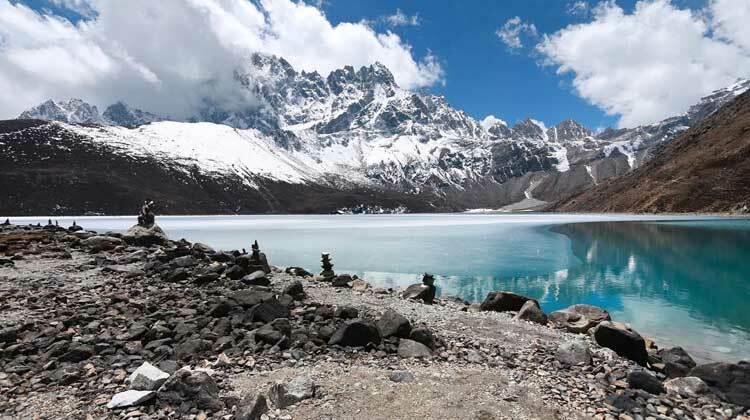 Besides, you can either use the regular EBC trekking route or walk across the Gokyo valley to Base Camp Camp. 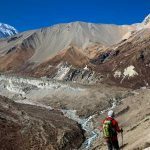 The Gokyo valley trekking route is for those who wants less-crowded trail and off-beat experience. Kalapatthar at 5,545m is the highest point; trekkers will be conquering during the trek. Kalapatthar is the most perfect spot to enjoy the dramatic view of Everest and other ice-giants. Everest expedition was first accomplished in 1953 by the team of Sir Edmund Hilary and Tenzin Norgay Sherpa. Since then, it has gained popularity more than ever and thriving day by day. Every year more than 50,000 trekkers visit Everest Base Camp. The quick answer is anywhere between USD 1,200 – 5,000. The cost highly depends on the service, trekking days, accommodation, transportation, numbers of guide and porter, you use during the trek. 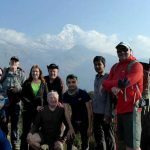 The average Everest Base Camp Trek Package must include the permits, round flight trip (Kathmandu – Lukla – Kathmandu), accommodation, meals and guides & porters. It depends on the trekking route. It usually takes 12 – 15 days to complete a normal EBC trek. The trekking route varies: according to acclimatization halt and extended trip included during the trek. Yes!! You can either a take a helicopter ride to Everest Base Camp which takes about 2 hours to compete the trip or choose a group mountain flight to Everest. You will fly across the Everest Base Camp and land at Kalapatthar to witness the marvelous view of Everest. In mountain flight, you will fly with a group and enjoy the aerial view of glaciers, ice peaks and mighty Everest. You will not land at the base camp – you will just fly over the Everest and return back to Kathmandu. 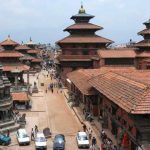 Due to its remoteness and isolation, all the foods has to carried up to the villages – most meals are to be prepared from the non-perishable ingredients – cereals, rice and grains – the authentic Nepal staple food. But the most common international cuisines are served – noodles, French fry, Pizza, Pasta and more. At Namche you will be surprised to get different kinds of International cuisines. Great thing is that all the foods are prepared from the farmlands right next to you. You will get find the meat on the menus of the most teahouse but we suggest you stay away from meat products, especially at higher altitude. Since all the meat products are to be carried from the lowlands, the freshness cannot be assured. Basically you will find twin-basis rooms on the EBC trekking trail. 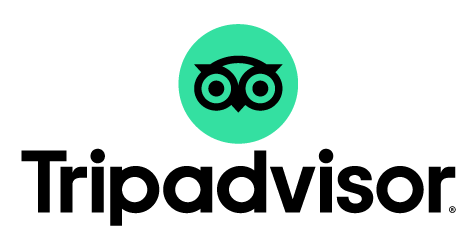 Most of the single rooms offers twin beds with basic services. Heater and hot showers are only available at expensive teahouse. Usually, you will a bed with a blanket which is warm enough at freezing cold. We suggest you to bring a sleeping bag with a liner for extra comfort. Yes and No both!!! Yes, only if you ignore the rules of height. Rock fall and falling down from the ridges are some hypothetical risks. Rules of height means the “you cannot rush and climb without rest and acclimatization”. With proper acclimatization and guidance of good guide, Everest Base Camp is 100% safe to travel. Frankly speaking, most of the travel companies mislead the information seekers. Everest Base Camp Trek is not for all the travel seekers. A strong determination and physical fitness is required. But it is true that the trek is doable: regardless of which age and size group you are. All you need is fitness and positive attitude. However, the extreme altitude, long distance and remoteness might be listed as the difficulty of the trek. But with proper preparation and guidance, EBC trek is way easier than you think. Starting from Lukla, Everest Base Camp trekking trail covers roughly 130km (round trip) which might seems quite long. But if you consider a typical guided trek, you will walking for 9 – 111 days covering about 15km per day (6 – 8 hours walk).